Every once in a while, usually after schlepping up and down the two flights of stairs between our master bedroom and our basement while doing laundry, I think seriously about moving to single-level house. Moving to a house with a small yard also sounds like a good idea after I’ve spent an afternoon raking leaves or pulling weeds in our large yard. Sometimes I browse the realtor websites, and I’ve even checked out a few Sunday afternoon open houses. So far, though, I haven’t seen a single house that has tempted me to actually buy it. And that’s a huge change for me, since my husband and I have a history of buying, and moving into, houses that could best be described as “fixer-uppers.” (We usually referred to them as dumps.) 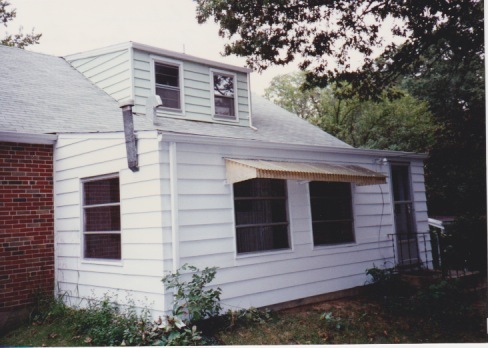 Basically, if we found a house that we could afford in an area we wanted to live in, we just figured we could turn the house into what we wanted with a “little bit of work.” When we bought our first fixer-upper, we didn’t have any particular rehabbing skills, but we did have a strong desire to become home owners, lots of youthful energy and that special kind of optimism that comes only with complete and total cluelessness. We weren’t put off by kitchens with no cabinets, living rooms with orange carpeting, bathrooms with blue toilets or peach-colored tile, basements that leaked each time it rained, or even a dining room with “I love you Mary” painted in huge letters across the wall. So I was surprised to realize that I’ve become so picky when it comes to even thinking about buying our next house. For the first time, I seem to be looking for the perfect house. These days I’m put off by ugly fireplaces, a master bathroom that’s too small, basement stairs that are too steep…things I probably wouldn’t even have noticed before. And if I had noticed, I would have simply assumed that it was something we could fix. Where I used to look at fixer-uppers and see only potential, now I just see work, and lots of it. I guess I no longer have the desire to deal with a rehabbing another house, even if we hired someone else to do it. I like to think that I’m just burned out after all those years of constantly working on our houses, or that I’ve become more selective in my middle age. But between you and me, I think the truth is that this particular middle-aged woman is just plain too old to want to fix up another house. You are becoming selective – selective in how you spend your time & energy (as well as blood, sweat, & tears). I only partially rehabbed one 1940s house & swore I’d never do it again, so kudos to you for doing it multiple times! Good luck with selling your house! I’ve always thought it would be nice to own a truly historic house, but I’m pretty sure I’m past that age now. Hope you find something great in Florida that lets you just move in and enjoy!